12in x 9in curved jade glass awards plaque. freestanding jade glass awards in curved shape design with bevelled edges, suitable for engraving as corporate recognition or achievement awards. The largest of four versions of these freestanding jade glass curved awards, this DY50 model measures 12in x 9in (290 x 225mm) and creates an impressive, and imposing, award for a wide range of events and achievements. Featuring a jade glass curve (jade glass has a greenish-blue tint) with polished bevelled edges, it is ideal for engraving with details of names, dates and accomplishments. We offer Low-cost text and logo engraving, so you can add a corporate or brand logo, club or society logo, or sponsors' logo to create a professional award for your event. 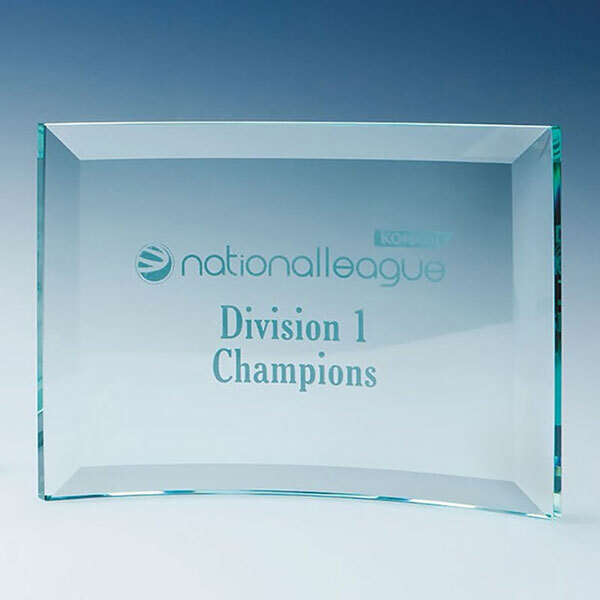 These jade glass curved awards are also available in three smaller sizes (DY48, DY49 and DY50), perfect for creating first, second and third-place awards.